Belgium’s Bernard Fonck sealed individual and team glory in Givrins over the summer, while Italy’s youngsters showed that they have a bright future in the Western-style discipline. Unlike other FEI riding disciplines that spread their meets across the year, Reining puts all its heat on one annual event in August. In 2017, this Summer of Reining saw both the FEI European Reining Championships™ for Seniors and the FEI World Reining Championships for Juniors and Young Riders™ converge in Givrins, Switzerland for a shimmering display of riding talent. 14 nations were represented at Givrins: Austria, Belgium, Czech Republic, Finland, France, Germany, Great Britain, Hungary, Italy, Netherlands, Slovakia, Spain, and the USA. The Summer of Reining events were hosted by CS Ranch, a Swiss private reining facility with a large covered arena and accommodations for 1,400 spectators. Owner Corinna Schumacher and show manager Eric Obrecht put together a five-star meet, culminating in the presentation of stunning gold, silver, and bronze statuette trophies. The riding at Givrins was worthy of the glitter, with Belgium’s Bernard Fonck ultimately securing gold in both the senior team and individual competitions. Ann Fonck, Cira Baeck and 22-year-old Bo Brutsaert had each scored well for the Belgians, but it was Bernard Fonck, out last, who lifted the total score to edge out Germany for first place. Italy were just half a point behind the Germans, with Gennaro Lendi recording the highest score of the day – a 223.5 – aboard the only mare in the senior competition. The in-form Fonck also became the first Belgian to clinch the coveted individual gold medal as he and athletic American Quarter Horse stallion Smart N Sparkin scored an outstanding 225. Germany claimed both the silver and bronze medals thanks to the 222 posted by Dominik Reminder and Dun It With A Splash, and to the 221 scored by Julia Schumacher riding Coeurs Little Tyke. 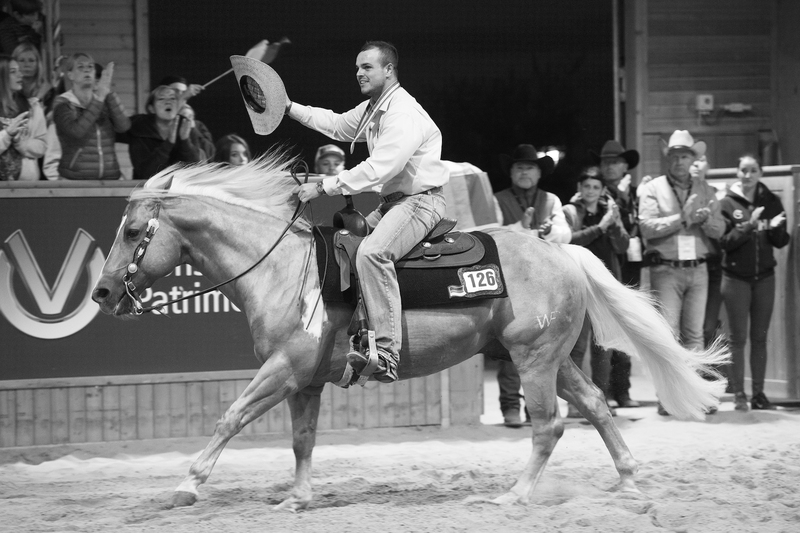 The growth of Reining was illustrated by the strength of young talent on show. Axel Pesek of France and Italy’s Matteo Manuel Bonzano demonstrated their prowess as the former came first in individual and third in team, while the latter came second in team and first in individual. Emma Lane of the USA made her journey to Givrins worth it as she helped her country to a third-place finish in the junior team competition, finishing just one point behind the leader. Bronze in the junior individual final went to Gabriele Landi of Italy, showing how her country has truly embraced Reining to put so many riders on the podium. Gina Schumacher was the playmaker for Germany as her breathtaking run helped her country to the young riders team competition. The silver medal went to Italy, with Belgium just behind in bronze. With a difference of just 2.34 points between the top three finishers, the level of competition remained tight and left it to the judges to determine who was just a smidge closer to perfection than the others. Schumacher also grabbed the gold in the young riders individual competition, with a high score for the meet of 74.83. Nico Sicuro of Italy secured the silver, while fellow countryman Dino Lulli took the bronze - another fine showing for Italy. The 2017 Summer of Reining also saw the inclusion of Para Reining for the first time, in what is sure to be a growing category for future meets. Next year’s FEI Reining focus will be across the pond as riders gather for the FEI World Equestrian Games™ in Tryon, North Carolina in September. Who will take home the metal in 2018? Any number of riders could find themselves on the podium, but one thing is for certain: they will have to rise to an awfully high bar set in 2017. Keep track of the 2018 Reining season and all the build up to Tryon with FEI.org.